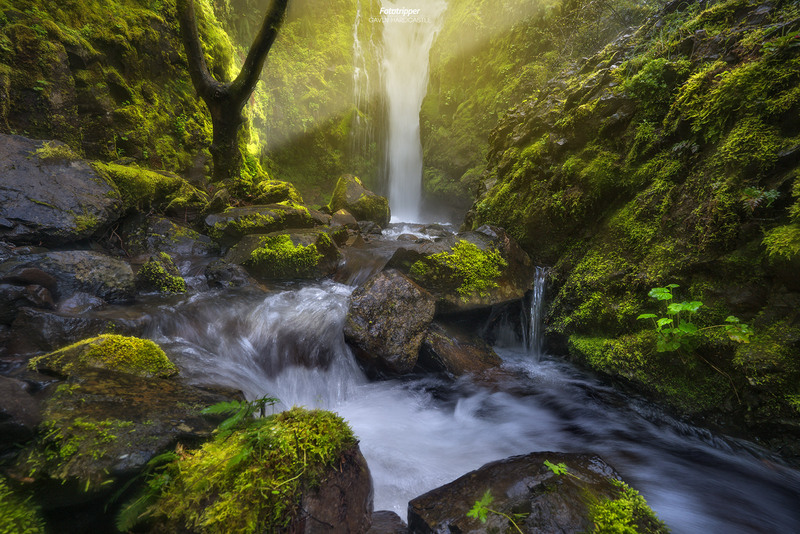 While scouting in the Columbia River Gorge in spring I chanced upon this lesser known waterfall and braved the spray and rain to capture this fleeting moment of light spilling into the narrow canyon. The major challenge with this shot was keeping the filter clean. It was raining most of the time and the spray of the falls made it a constant game of ‘shoot and wipe’. After some frustrating attempts to get the shot I was getting ready to quit and that’s when it happened. For a minute or two there was a gap in the rain clouds and a blast of sun light shone right into the canyon to offer some dramatic back light to the tree. I just kept on shooting until the clouds closed up and the rain began again in earnest. It’s those precious seconds that produce the best shots.